November News: Development Updates, Transportation News + More! More than 100 golfers joined us for the Ron Rotella Golf Classic at Rocky Point Golf Course on October 26. Tournament contests and a post-tournament awards and dinner reception were part of the festivities. Thank you to our players and volunteers who participated this year. Special thanks to Silver Sponsors Grow Financial Federal Credit Union, HCI Group, Inc., McKibbon Hospitality, MetWest International, Moffitt Cancer Center, Redstone Commercial and Tampa Hillsborough Expressway Authority. Thanks to our media sponsors, Tampa Bay Business Journal and WUSF Public Media, and to our photography sponsor MamaRazzi foto! View event photos here. Westshore accounted for more than half of the office leasing activity in Hillsborough County this year. Westshore continues to lead Hillsborough County with the highest asking rent rates. Westshore is currently the only location in Hillsborough County with new office development under construction. MetWest Three will feature 250,000 square feet of office space with anchor tenant PwC. Taylor Morrison began construction of its model homes at The Cove at Rocky Point, a luxury waterfront residential community featuring single family homes and townhomes across from Rocky Point Golf Course. Learn more about this and more major Westshore projects on the Alliance's interactive Development Map. Financial planning and investment management firm ProVise Management Group will celebrate the grand opening of its first Westshore location this month at 4350 W. Cypress St.
Now open in Westshore is Tampa Nails located at 4730 W. Cypress St. at the intersection of West Shore Blvd, as well as Salon Lofts at 4545 W. Kennedy Blvd. Priano celebrated its groundbreaking last month at 3429 W. Spruce St. The design center is scheduled to open next year and will bring together architects, interior designers, contractors, builders and design enthusiasts into an environment filled with residential and commercial cabinetry, countertops, flooring, plumbing fixtures, appliances, technology and more. The Westshore Alliance Board of Directors endorsed the Hillsborough transportation sales tax referendum (County Amendment #2), which is on the November 6 ballot. The plan will fund road, transit and pedestrian projects that are needed across our community. You can learn more about the referendum at AllForTransportation.com. For information about how the funds could be used in the City of Tampa, check out the City's Transportation Department fact sheet about the referendum's possible impact. The Florida Department of Transportation is holding a public meeting ahead of the final decision for the Interstate 275 improvements included in the Tampa Bay Next projects. 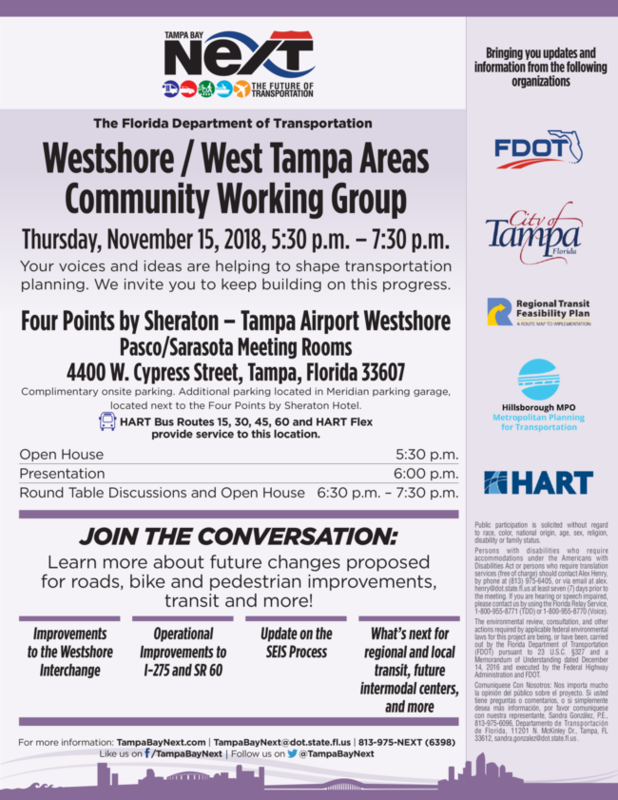 On Thursday, Nov. 15, the Westshore/West Tampa Community Working Group will hold a meeting at the Four Points Sheraton Westshore starting at 5:30 pm. For more information, visit TampaBayNext.com. The Westshore Transportation Action Plan is available on the Reports + Presentations page of the Alliance's website. More than 100 projects from highways to buses and bike paths are listed as projects Westshore businesses and residents will need in the next 25 years. If you are an Alliance member looking to get involved in our transportation advocacy, join us at our November 7 Transportation Committee meeting. The HART MVP Express launches on Sunday, November 11 to take Buccaneers fans to the final five games of the season. Starting with the Redskins game and ending with the season finale against the Falcons, HART's MVP Express will provide round-trip service from four locations in Hillsborough to Raymond James Stadium. This is a pilot program to determine demand for future gameday transit service for other Tampa sporting events. Visit GoHart.org for locations and fares.